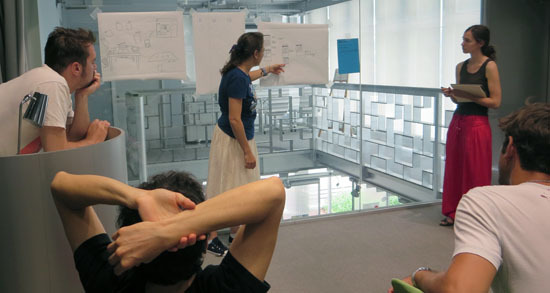 A third Feeler co-design workshop was organized with Kyushu university foreign exchange students. The workshop aimed to identify Quantified Self technologies practices that differ from those discussed with asian students. 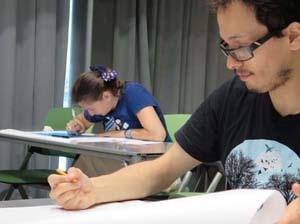 The four students that took part in this last workshop came from Europe (Germany and Italy) and South America (Colombia). Their ages ranged from 23 to 28 years old and they had spent between 4 and 12 months in Japan. 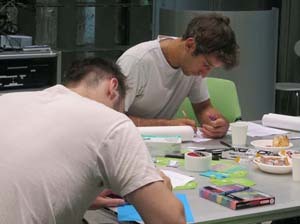 The structure of the workshop was the same that in the ones organized with Asian students. Prior to the session, they were asked to fill an online survey about ICT use. 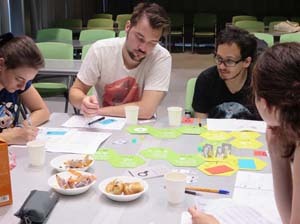 The face-to-face meeting consisted in playing the Feeler reflection game and creating an information visualization design that later on was shared and used as central element of the group discussion. Regarding the ICT use, the survey answers indicate that there aren’t great differences between Asian and foreign exchange students. The few differences in the use of ICT can be explained by changes in the lifestyle due to the move to a different country. Some of these differences are a slightly higher use of online entertainment and banking services than Asian students. In the case of the last ones, who have lived for longer periods in Japan (if not all their lives) their answers show that they make a slight more intensive use of ICT for planning things and organizing life, for making friends and socializing and also for job hunting and for using e-government services. Despite the differences, it is important to notice that foreign students’ answers relate to their current ICT practices, so it is not sure that users would maintain same ICT habits when moving back to their home countries. During the game, participants’ selected diverse datasets (in 2 cases combining the areas of physical activity, sleep and study activity, whereas in the other 2 cases, they preferred to just focus on one area (in one case on study activity and in the other on in physical activity). The main difference with Japanese students’ choices was the few interest on monitoring subjective feelings. Whereas in previous workshops almost all participants opted for monitoring how they feel after a performing a certain activity, in the one conducted with foreign exchange students the importance of this data was very marginal. In this workshop, the most preferred technologies for monitoring data were mobile devices. 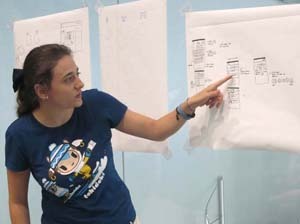 None of the players selected monitoring the data by hand, while in previous workshops some participants picked this option. The type of the information visualizations designed during the session consisted in a bubble chart, a bar chart combined with geographical information, dashboard (containing several bar charts) and a ambient visualization based on the use of Augmented Reality. Similarly to earlier workshops, wearable and ambient visualizations where exceptional and most of the participants preferred to display the information in well-known formats, mostly based on line, graph and bubble charts. 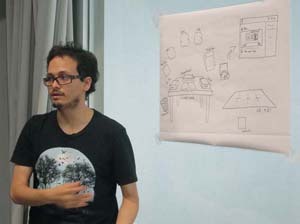 In the group discussion about the artifacts designed, some of the participants indicated that, from their point of view, infovis was a tool for developing awareness. As one of them mentioned in the online survey, capturing data about a certain situation is “as a first step of being able to change something, I wanted at least get aware of certain habits”. In most cases, the collection and visualization of data was regarded as a tool for informing future actions, that’s to say to take decisions and better plan their activities. Although none of the assistants made regular use of self-monitoring technologies, some of them recognized having used them. In one case, it is interesting to note that despite the person self-monitored her heart rate for health purposes, she didn’t considered that as a self-monitoring practice. As regards sharing their data with others, participants were concerned about their privacy. Although they recognized that, in some cases, sharing results with others can help increase motivation, participants were reluctant towards this kind of motivation since it depends on external feedback rather than on individual convictions. In conclusion, despite coming from different cultural backgrounds, workshops didn’t show significant differences between Asian and foreign exchange students. Different perceptions and practices dealing with technologies for self-monitoring are associated more with personal opinions and backgrounds rather than belonging to a particular cultural group.